Separate recycling with 2 different openings and compartments in 1 bin. BRUTE bins with 4 vented chambers allow air flow into the chamber making it 50% easier to remove liners. 76L Food grade Rubbermaid Round BRUTE Containers. Durable, heavy-duty containers for a variety of uses. 122L Food grade Rubbermaid Round BRUTE Containers. Durable, heavy-duty containers for a variety of uses. 166L Food grade Rubbermaid Round BRUTE Containers. Durable, heavy-duty containers for a variety of uses. Rubbermaid 3600-88 Ingredient Mobile Bin with Sliding Hinged Lid Comes with rounded corners and smooth walls for easy cleaning. Rubbermaid 5714-73 53 Litre Recycling Box Recycling Boxes Stackable recycling boxes made out of post-consumer recycled resin (PCR) perfect for commercial recycling use Can be nested for storage. Rubbermaid 8160-88 Marshal Classic Fibreglass Trash Container for indoor or sheltered outdoor use. 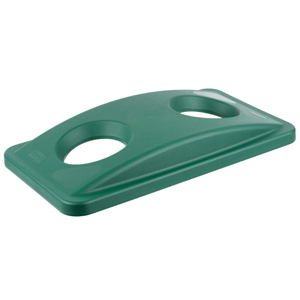 106 litre square plastic container gives greater capacity than round containers Easy to lift grips, anti jam nesting storage. Shelf ingredient bin quick one handed access while stacked and integrated measuring tool increases preparation efficiency, space optimization, and promotes food safety compliance. Stainless Steel Dollies hold 1 or 2 Slim Jims for ease of movement and relocation with lockable castors. Food grade Rubbermaid Round BRUTE Containers. Non-vented for easy cleaning and solid side for scooping contents. 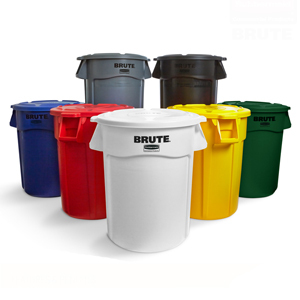 Durable, heavy-duty containers for a variety of uses.